Lakers guard Jordan Farmar plans to get evaluated within the next week after nursing a strained right groin that has sidelined him for the past seven contests. Farmar received medical clearance on Monday to begin practicing, but he said he needs to increase that workload before jumping into a game. But when that happens remains to be clear considering the Lakers are likely to have off on Thursday following a slate of back to back games vs. Portland (Tuesday) and Sacramento (Wednesday). The Lakers will likely practice on Saturday, but those sessions are usually considered light. Most veterans use that time as well to receive treatment. “We just have to find time for me to build that endurance,” said Farmar, who reporting completing Monday’s non-contact practice without any setbacks. The Lakers have avoided having contact practices because of the injury-laden roster. Farmar said having that won’t deter him from returning. Meanwhile, Lakers coach Mike D’Antoni considers Steve Nash (back) and Xavier Henry (right knee) as game-time decisions Tuesday against Portland. Pau Gasol’s status is listed as probable after missing the past four games because of vertigo. Something made Pau Gasol’s head spin, and no he isn’t still experiencing vertigo. Gasol does not understand why Lakers coach Mike D’Antoni hesitates to play Chris Kaman along with him after he posted 28 points on 13 of 18 shooting in the Lakers’ 125-99 victory Sunday over the Phoenix Suns. Or after seeing Kaman average 14 points on a 47.9 percent clip and 8.8 rebounds in the seven starts over Gasol while nursing various ailments. But after signing a one-year, $3.2 million this offseason, Kaman has experienced what he has called his most frustrating season in his 11-year career. Kaman has averaged 10.3 points in 18.6 minutes, but has only appeared in 38 games. D’Antoni has often credited Jordan Hill and Robert Sacre for having superior defense and for Kaman’s versatile skillset becoming less valuable because it mirrors Gasol’s game. With three liters of intravenous fluid just inserted into his ailing body, Pau Gasol struggled processing what had just happened. Gasol just exited the Lakers’ win over Orlando last week after feeling dizzy and light-headed for no apparent reason. Soon after, he lay on a stretcher en route to an ambulance wondering when the pain would ever end. The crowd rose to its feet. The decibel level shook the ground as if another Earthquake rumbled through Los Angeles. And then the claps and the cheers continued. In normal circumstances, the elation and the ensuing confetti that drops from the Staples Center ceiling coincides with another key Lakers’ victory or even an NBA championships. But this is not one of those seasons with the Lakers destined to miss the playoffs for only the fifth time in franchise history. So amid a depressing season, the non-sellout crowd of 18,355 fans at Staples Center clung onto something less significant. A rare Lakers’ 125-99 win Sunday over the Phoenix Suns at Staples Center and the relative comfort that overpriced tickets to the game were offset with free tacos at Jack in the Box. Ryan Kelly proved the catalyst in ensuring Laker fans would walk out of the arena with a coupon in their hands. Kelly jumped across the lane to block Dionte Christmas’ three-foot layup attempt with eight seconds remaining, capping a 90 second sequence in which the Suns went scoreless. The dread on Mike D’Antoni’s face told the entire story. Chris Kaman had just posted 28 points on 13-of-19 shooting, 17 rebounds and six assists in the Lakers’ 115-99 victory Sunday over the Phoenix Suns at Staples Center, a rare feel-good moment for a player that had mostly become the casualty of D’Antoni’s system that calls for stretch forwards. 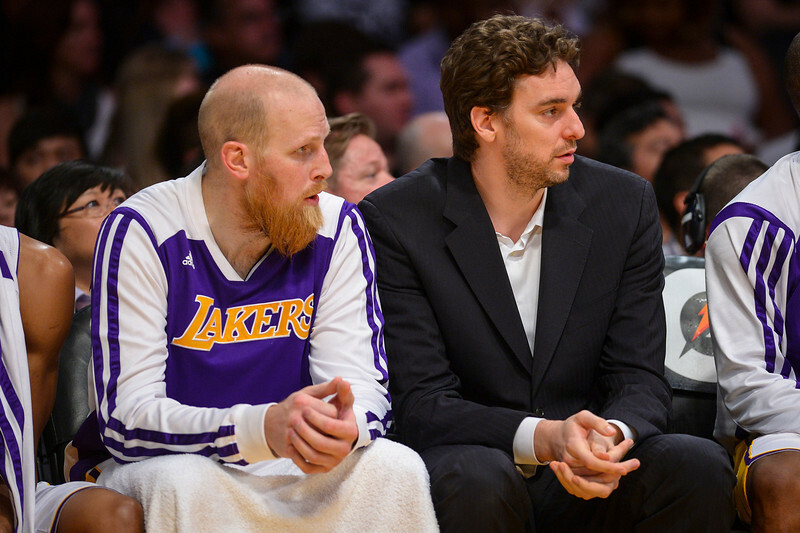 Kaman has only started in the past four games because Pau Gasol has suffered from vertigo. Kaman also lasted only five minutes in the Lakers’ loss Friday to Minnesota after playing sub-par defense on Nikola Pekovic. So with the possibility that Gasol returns sometime this week, where does that put Kaman? Immediately back to the bench? 1. Chris Kaman seemed unstoppable. He unloaded a season’s worth of frustration stemmed from a reduced role, numerous injuries and persistent losing and channeled it into a pretty dominant performance. So dominant that Kaman’s 28 points on 13 of 17 shooting and 17 rebounds nearly matched his career high 29 points set with the Clippers against the Houston Rockets on Dec. 22, 2009. The irony of this development seems too striking. Kaman cemented an eight-year career with the Clippers that included an All-Star game appearance the same season he set his previous career high in points. Kaman has called this year the most frustrating of his 11-year career for obvious reasons. He came here on a mini mid-level deal worth $3.2 million believing the Lakers would use him as a worthy consolation prize toward losing Dwight Howard. Instead, Kaman has mostly found himself toiling on the Lakers’ bench. He’s also only two days removed from playing the first five minutes of the Lakers’ 143-107 loss Friday to Minnesota, a stretch that featured shaky defense on Nikola Pekovic. 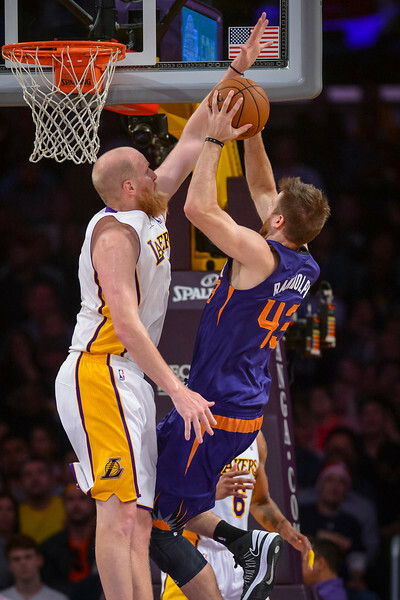 But against Phoenix, Kaman unleashed everything that made him such a valuable signing. He canned mid-range jumpers and putbacks. Kaman played a solid pick-and-roll game besides an erroneous moving screen call that also sparked a technical foul. Kaman’s season-long weakness on defense relatively improved too. 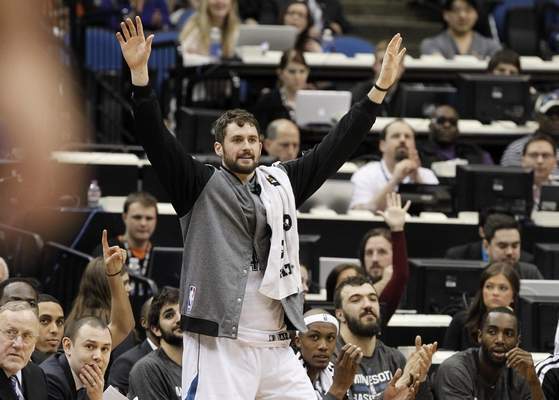 All of this elation could die down as quickly as Tuesday against Portland, especially against Pau Gasol. But for Kaman’s sake, he provided a showcase game worthy to appear on his free agency resume tape. 2. The Lakers defense improved. No one will mistake the Lakers as the 1980’s Detroit Pistons or the 1990’s New York Knicks, two teams that bullied and intimidated opponents with their bruising strength and toughness. But after spending their recent two-game trip not showing a lick of effort in this area, the Lakers channeled the same defensive energy that ensured recent home wins against Orlando and New York as well as another round of free tacos. The Lakers held Phoenix to a 38.9 percent clip from the field, including a surprising 7-of-25 combined mark from the Suns’ talented backcourt in Goran Dragic and Eric Bledsoe. The Lakers limited their turnovers, which helped tamper down on issues surrounding transition defense. The Lakers’ crisp ball movement (29 assists on 53 field goals) channeled added focus on the other end. By and large, the Lakers are a defensively flawed team. They lack a consistent rim protector. Even though they feature bouts of speed and athleticism, the Lakers usually lack enough strength in those areas against other young NBA teams. But the Lakers can offset those disadvantages through pretty simple concepts, including better shot selection and ball handling, stronger communication and effort. The formula worked against Phoenix, which also took way too many outside shots just because they were open. But in the remaining nine games, the Lakers have yet to prove they can showcase such a mindset consistently. Both Pau Gasol and Xavier Henry will sit out when the Lakers (24-48) host the Phoenix Suns (44-29) tonight at Staples Center because of persisting injuries within the past week. Gasol will miss his fourth consecutive game because of vertigo. Lakers coach Mike D’Antoni said Gasol completed cardiovascular exercises, but says he still “feels a little loopy.” Henry will stay out of his second consecutive game because of soreness in his right knee, an injury that had sidelined him for a combined 29 games this season. 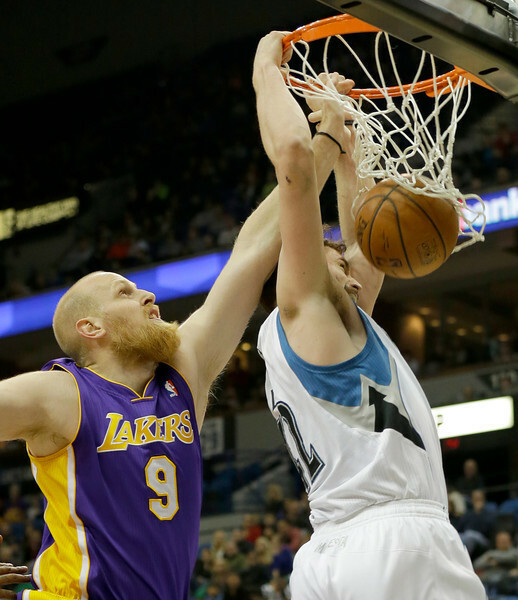 MINNEAPOLIS — Chris Kaman found himself back on the bench again, and new reasons emerged. They did not involve Pau Gasol returning to the lineup. He still remains sick with vertigo. Nor has Lakers coach Mike D’Antoni gone back to his small-ball philosophy. Instead,Kaman lasted only five minutes of the Lakers’ 143-107 loss Friday to the Minnesota Timberwolves at Target Center after seeing Nikola Pekovic scored eight of his team-high 26 points within that time frame. D’Antoni was referring to Ryan Kelly and Robert Sacre, both whom showed better defensive effort and likely fit more within the team’s long-term plans. Kaman signed with the Lakers this offseason at the mini mid-level exception worth $3.2 million, saying recently that he should have researched more about how D’Antoni’s offense would feature him before joining on board. Kaman also took issue with D’Antoni’s thought process. Nash posted four points and six assists in 15 minutes while Kaman had two points, a rebound and a steal in five minutes, 37 seconds. But the circumstances are different. The Lakers only have one traditional point guard in Kendall Marshall, who went scoreless on six missed field goal attempts in 15 minutes. Sacre (14 points on 6 of 11 shooting in 30 minutes) and Kelly (nine points on 4 of 11 shooting in 23 minutes) immediately showed more hustle on defense than Kaman did. Kaman’s frustration hasn’t simmered after missing a recent 10 game stretch, nursing a sore right foot and missing the beginning of the Lakers’ trip this week to handle a personal matter. But he still had started the three previous games posting double digits. MINNEAPOLIS — Only two days beforehand, Steve Nash considered his back so painful that he would not even try to play on the Lakers’ two-game trip. The concerns no longer rested on whether his body could sustain the physical wear and tear. Instead, the nerve irritation became so bothersome that his workload reduced toward nothing more than spot-up shooting drills. Yet, there Nash was on the court in the Lakers’ 143-107 loss Friday to the Minnesota Timberwolves where he posted five points on two of five shooting and six assists in 15 minutes. Both the game and Nash’s stat line proved meaningless, but his on-court presence revealed everything about how he’s still finding purpose in a lost season. For once, that progress did not entail Nash making any turns for the worse. Why Nash played hinged on three factors. He reported feeling healthy enough to play. The Lakers suffered an additional injury with Xavier Henry sitting out because of increased soreness in his right knee, an injury that has sidelined him for 28 other games this season. Lakers guard Jordan Farmar plans to get reevaluated this weekend in hopes to return late next week after missing the previous six games because of a strained right groin. The Lakers had originally shut Nash down earlier this month in part because they wanted Kendall Marshall and Farmar to have significant minutes so they could properly evaluate how they fit into their long-term plans. MINNEAPOLIS — Kevin Love provided something depressing for the Lakers, and it went beyond the Minnesota Timberwolves handing them a 143-107 loss Friday at Target Center with 22 points, 10 rebounds and 10 assists, his second triple double of the season. He also poured cold water on the Lakers’ hope that they could acquire him as a free agent in the 2015 offseason. So much for being born in Santa Monica, playing at UCLA and spending his summers in Los Angeles that entails the beach volleyball circuit.